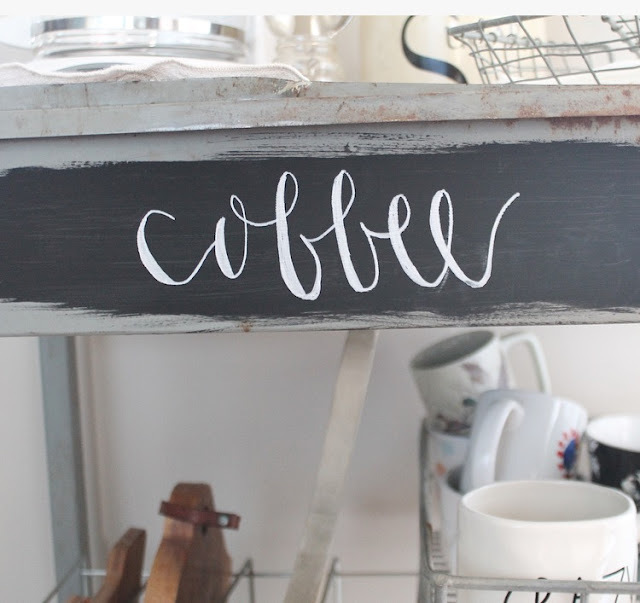 One of my all time favorite things to do is grab a coffee on a Saturday morning and hit some garage sales! Garage sales and estate sales are where I have found some of my favorite pieces in my home and usually for steal! Last fall, my mother and I came across a garage sale and I immediately spotted a metal cart. 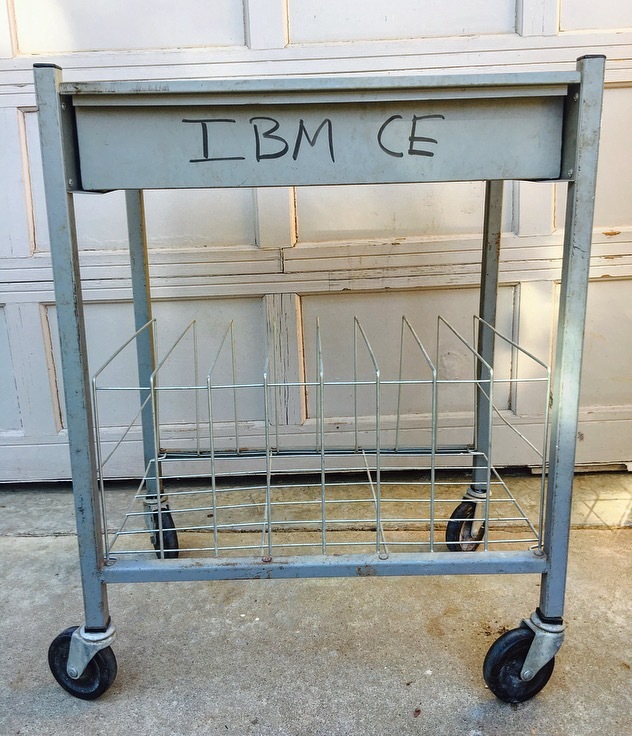 It was covered in dust and rust and my mother couldn't believe I was actually interested in it. It was marked for $3 bucks so I grabbed it and hauled tail to the woman to pay. I seen several potential options for it that my mother couldn't see but she had faith that I would come up with something cute for it. Here is a before picture of it below. My original thought was to add wood to the top and use it as an island in my kitchen. 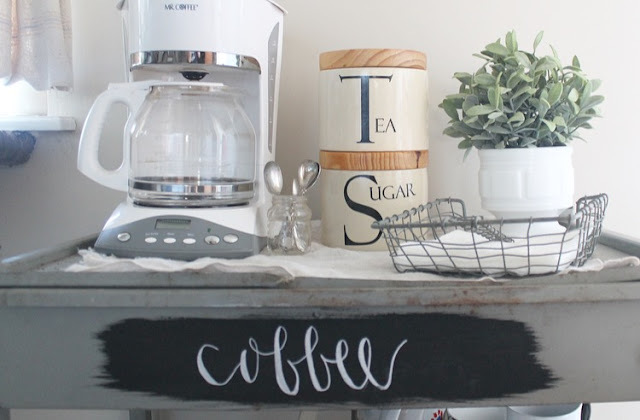 I may still use this idea in the future but for now I will use it as a coffee bar. I scrubbed the rust and disinfected all the surfaces before moving forward. The letters wrote with a sharpie on the front would simply just not come off...so I had to come up with a solution. 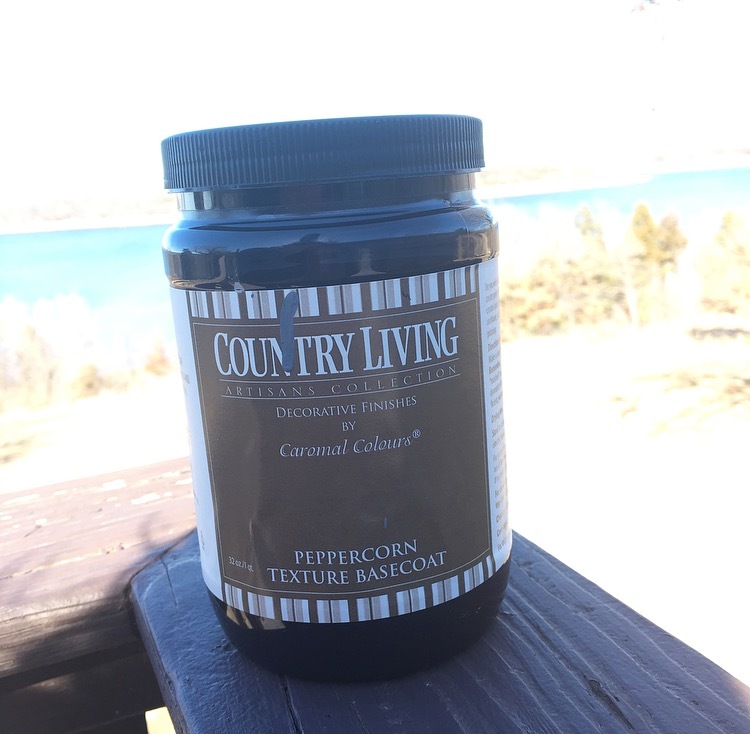 I had some of this Country Living chalk paint in black leftover from another project. I took a paintbrush and painted over the letters leaving stroke marks at the end. I didn't want to cover the whole drawer in black. 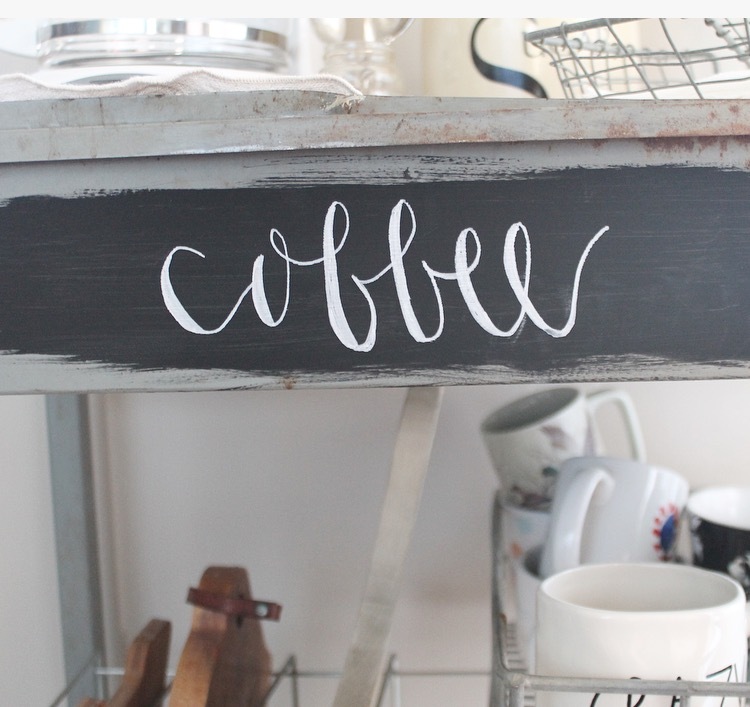 I then took a chalk marker and wrote the word "coffee" in a cute calligraphy. 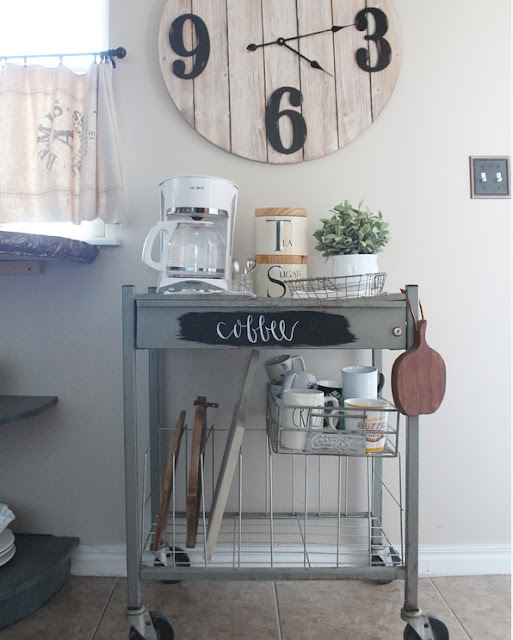 Here is the after photo below of how I styled it for my coffee and tea station. Not bad for $3 in my book! I added this vintage, metal Coca Cola wire basket below to hold all my coffee mugs. I use a regular, 12 cup coffee maker because I drink several cups throughout the day...so my Keurig really doesn't get used anymore. 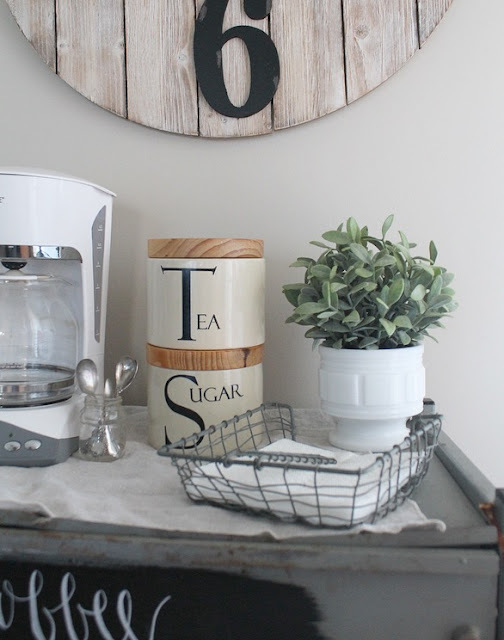 I added some little spoons, napkins, and some greenery to complete the space along with my tea and sugar canisters. The drawer holds items like my coffee filters and crocheted mug holders. I used the metal dividers below as storage for my wood cutting boards. 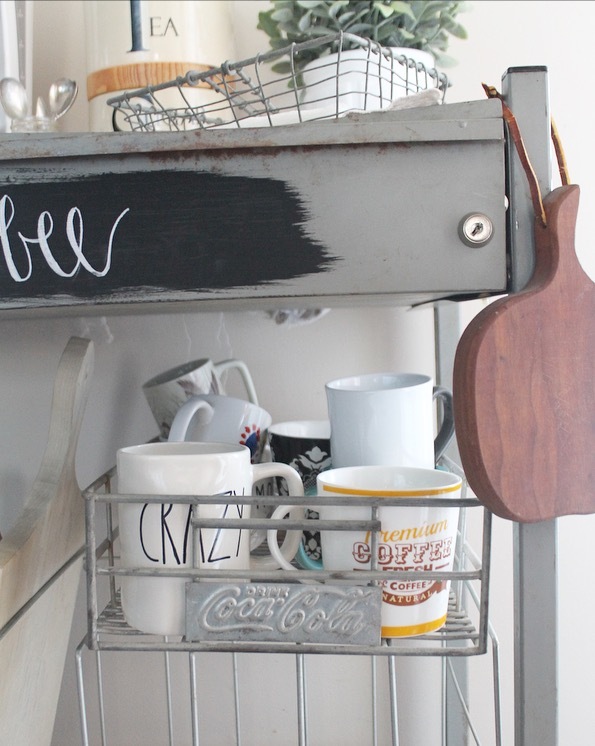 I also hung a cute, vintage cutting board from the side. I love coming here in the mornings for my coffee. I found the clock from Hobby Lobby. I've added a "shop the post" collection below with similar items if you love this look! Thanks for stopping by, I would love to hear what you think of this space! This turned out so lovely Daraka! I love the colour you chose and how you wrote "coffee" on the front!! Thank you so much for sharing your project over at Waste Not Wednesday this week! Pining to share! I wish I had room in my house for a coffee bar cart. This is adorable. Thanks for sharing it with us at Waste Not Wednesday.